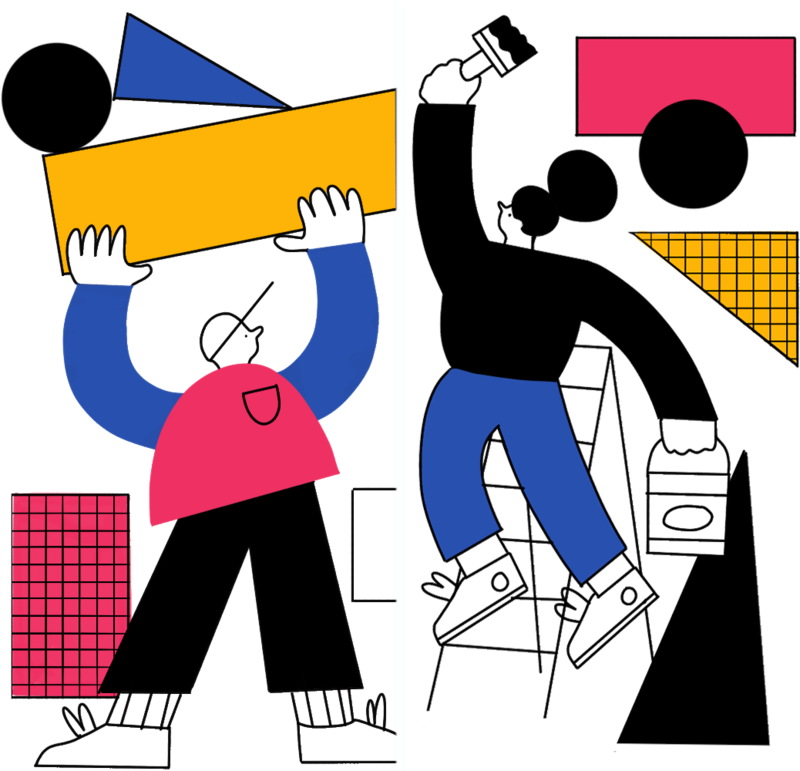 How can you tell when you should split things up or keep them together? You can identify a base that could use an efficiency tune-up by keeping an eye out for one specific thing: redundancy. You have multiple tables in the same base with similar and/or identical fields that don’t use linked records. You have multiple tables in the same base with similar structures and uses. You have a table that summarizes information in other tables without using linked records in the same base. You find yourself copying and pasting records or table structures often. You have multiple tables in the same base that track different stages of projects or deals, even if those tables have different structures and fields. You create new tables for different time periods (e.g. weeks, months, quarters, etc.). You create new tables that target different platforms (e.g. social media like Facebook and Twitter). You create tables categorically (e.g. different types of products, music or movie genres, types of events, etc.). You create tables for each member of your team or for specific collaborators. In each case, you have an opportunity to combine multiple tables into one. For example, if you create a single table for each member of the team they likely have the same structure or a similar one. Instead, you can use a collaborator field (or even just a text or select field) to assign tasks to individual collaborators and group records to keep them separate. Furthermore, you can create individual views that use filters to only display tasks for one collaborator at a time. You can use a separate view to see everything at once while also sharing individual views with each member of your team. You may find it difficult to combine your existing tables if you’ve used a redundant structure for a while. For some additional step-by-step help that provides solutions to these common dilemmas, consult this support guide. You find yourself entering the same information into the same table multiple times (e.g. contact information when tracking activities or information about the parent project for tasks on your to-do list). You have a single table that keeps track of the same thing using multiple records. You have a single table with more than one select field and those select fields commonly relate to one another. In most cases, if you find yourself repeating the same data you can avoid this by creating a second table and linking records together. If you skipped the earlier sections concerning linked records, go back and check them out to see how you can easily solve these problems so you don’t wind up creating a table packed with an overwhelming amount of information. For more help identifying instances where linked records and relationships can help save you time, check out this support guide. While you’ll find more redundancy in tables, sometimes similar problems can happen in bases. In general, you want to create your bases with a specific purpose and broad capabilities. For example, you’ll get more out of a base that functions as a CRM than a simple address book. Both have specific purposes, but a CRM provides broader capabilities. You can identify these broader capabilities by considering the different ways you can use the core information in the base you want to create. If you start with an address book, you can turn it into a CRM by adding tables to track general activities, sales, support, and more. By linking those tables together, you not only avoid creating bases with redundant tables but you let the information in that base work together to help you accomplish more. Airtable blocks—a pro feature—add powerful new features directly to your base in a modular way. With blocks, you can import and export information from your base in a variety of ways, create entirely unique layouts, generate graphs, and much more. You can even organize the blocks of your choosing into separate dashboards for specific audiences or uses. Let’s take a look at a few ways blocks can help you do more with your bases. To get started, click the “BLOCKS” button in the top righthand corner of your base. Unless you’re working with an existing template, this will bring up an empty dashboard with a message encouraging you to create your first block. Click “+ Add a Block” to take a look at your diverse set of options. In the future, when you know which block you want to use by name, you can start typing to filter your options and find it quickly without the need to scroll through everything. For now, browse through the list to get an idea of what’s available. Even if you don’t need most of the blocks right now, you’ll likely find they come in handy later on. 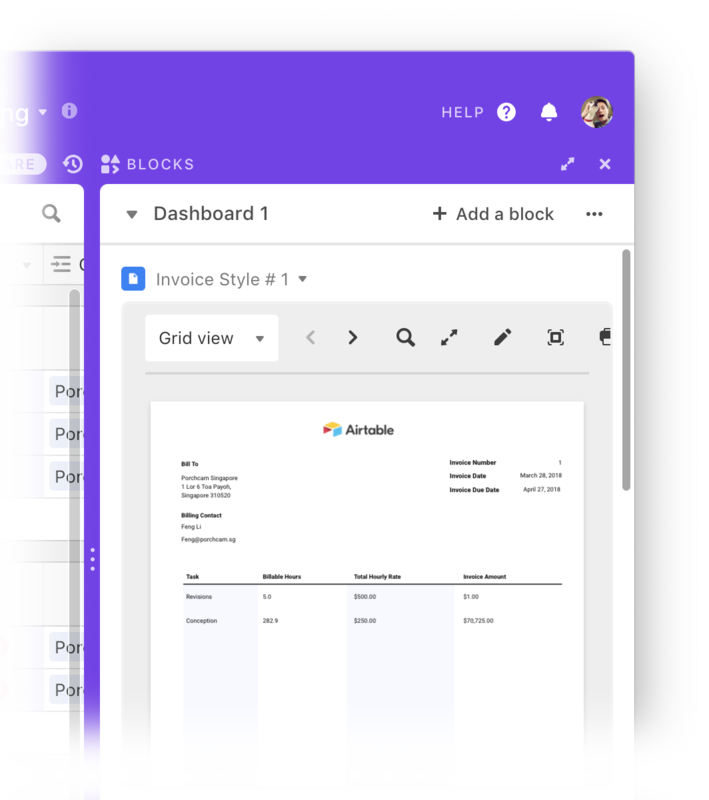 In a base that manages orders and invoices, you can use blocks to track time and even generate multiple styles of invoices. The page designer block lets you take any table’s information and create a printable layout. You can also add static text and images to your layouts when you need repeating elements like a company logo and contact information. You have control over fonts, font sizes, colors, and more. When you have a table with linked records, you can display them table format, as a list, or without any specific formatting. When you need to track billable time, the time tracker block provides a one-click button to handle the task for you. Whether you want to track time for tasks/projects in specific records or create new records it can handle both. Because blocks contain a lot of visual information, you won’t want to add too many to your initial dashboard or you’ll end up scrolling through it to find what you need. By clicking the dashboard selector at the top of your blocks, you can rename it to something specific as well as create additional dashboards for other purposes. You may find you need multiple dashboards with similar purposes when you have collaborators tracking their time individually. Furthermore, you may want to create separate dashboards for separate purposes. For example, the calendar, contact, XML, CSV import blocks can fill out their own dashboard when you need to import information of multiple types from multiple sources. The Sendgrid and Send SMS blocks work well for CRMs and marketing bases. When you need virtual meeting capabilities, you can rely on Google Hangouts and appear.in blocks for direct access from your base. Some blocks fit together in obvious ways, but your workflow may bring different types of blocks together as well. Dashboards provide a grouping structure so you can manage these helpful tools in a way that makes sense to you. To learn more about blocks, check out this comprehensive support guide. It contains more overall information while also providing deeper dives into every single individual block—with video demonstrations, too. 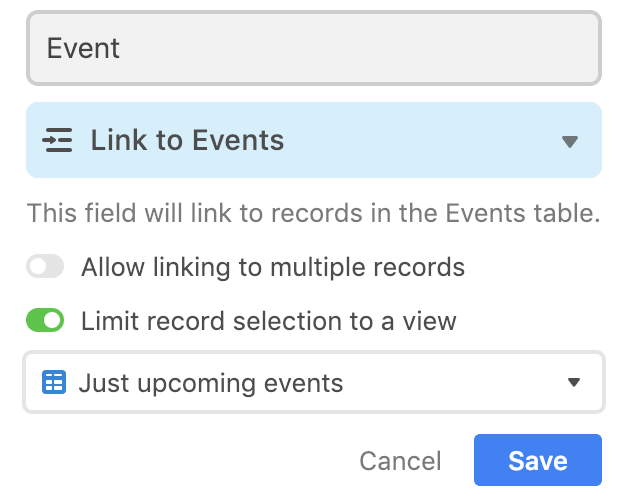 When you use linked records to create a relationship between one table and another they will instantly have access to all of each other’s records. In many cases you’ll appreciate this freedom because you can easily access whatever you need without restriction. In some cases, however, you’ll want to impose restrictions on linked records by filtering out specific ones in order to reduce clutter, hide them from specific collaborators and/or public views, or restrict the choices available in a form. To impose a limitation on a linked record field, you first need to create a view in the originating table—the place the linked records call home—with a filter that only displays the options you want to show up as options in the linked record field in the other table. You can create any kind of filter you want—just make sure it shows only the results you want. If you need help creating the perfect filter, check out this support guide. Once you’ve created your filtered view, edit the linked record field. Look for the option called “Limit record selection to a view” and toggle it on. Select the filtered view you just created from the list of options and save your changes. Now only records in that view will show up as options when attempting to add any to the linked record field in this table. For more information on filtering linked records, check out this support guide. To learn how to use this feature to create a specific kind of tool, such as a booking system, you’ll want to read this tutorial as well.